No victims were ever more innocent, no killer more unknowable, no murder more unfathomable. 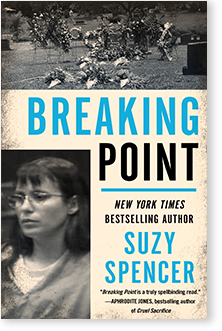 Suzy Spencer weaves the dark threads of mental illness, infanticide, and punishment into a classic true-crime tapestry that is both thorough and gut-wrenching. The tragic but still-unfinished story of Andrea Yates still leaves a lump in your throat. -Ron Franscell, bestselling author of "The Darkest Night"
What would drive a mother to kill her children? Drawing from hundreds of hours of interviews, court testimony, and medical records, including new access to psychiatric and legal files, Breaking Point traces the story of an all-American family struggling with the darkness of a mental illness that twisted a loving mother into a killer obsessed with hellfire.